...it's no wonder Fijians are said to be the happiest people on earth - they get to wake up to this. Stopping by the activities desk, you can sign up for one of three dives per day, and the resort provides all of the equipment you need. We could choose from 9am, 11am or 1pm. Based on the divemaster's descriptions, we went for the 11am - for more balance of coral and fish - even though that meant missing the Fijian bracelet weaving class (I know, rough life). But first things first: breakfast on the beach! That the only tweeting came from actual birds; the soft rustling of palm branches swaying in the ocean breeze, to the rhythm of island time: this was the very definition of serenity, and paradise. Buffet tables set up by the pool (yep, there is one, for those who for whatever reason don't want to take the few steps into the crystal clear ocean) offered food to please every international traveler. There were the basics: eggs, fruit, toast, juice, and hot stations where you can get omelets or crepes made to order. We were excited to try the Fijian coconut filled 'pancakes' that were more like giant, sweet, chewy empanadas, and topoi (doughy chewy bread made with coconut cream). And, raw coconut shards (though, I think I much prefer the tender meat from young coconuts). While resting on a lounger after the ultra-strenuous morning, a random puppy came up out of nowhere and lay down next to me, quiet but for the sound of gentle breathing - and turned his head to watch and listen to waves washing ashore in such a way as if to say "do this with me". It lasted just a few minutes - but that turned out to be one of my favorite, most randomly magical moments, for this often over-thinking, over-planning OCDer while in Fiji. Since we had a bit of a wait until our dive, and to ward off food coma, we took a hike up the beach. When we pulled up to the island by speedboat on Day 1, I'd noticed a large tree that looked different from the others, and seemed to form a canopy over a recess in the rainforest-like greenery. We decided to hike that way to explore - and Random Puppy came along, leading the way. Turns out the recessed tree was not the hidden gateway to some secret lost indigenous village, nor a cover for the TARDIS, but simply a place that naturally formed to provide shade to small animals. But it was a lovely hike nonetheless, with frequent breaks to dip in the water for relief from scorching heat. I wondered what life would be like, as a puppy in paradise, with fresh supplies of guests to adore him daily - and free run of the place. Arriving back just in time for the dive meet up - we took a 10 minute boat ride out to the site. 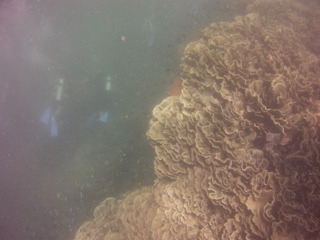 The original location was to be Tom's Thumb - but due to rough waters, we moved to the Cabbage Patch instead - where we saw giant coral formations in the shape of cabbage blossoms! I got to give my new SeaLife MicroHD+ underwater camera a test drive, before the big shark dive later on in the week (wouldn't want to be fumbling with buttons while they swirled around us!) - excuse the quality of video - I was and am still learning how to use it! 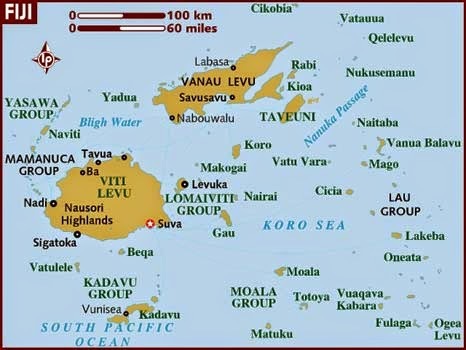 To be honest, I had envisioned giant schools of fish in every direction - but I think that would be more over at the Rainbow Reef by Vanau Levu / Taveuni islands - which I hope to get a chance to visit next time. We definitely burned off enough energy during the dive to justify wolfing down lunch! There was Beef Curry with pampadam and naan. And the Fijian interpretation of 'Thai chicken soup with rice noodles' and vegetables. All very fresh and tasty. I love that the hardest decision we have to make while at Blue Lagoon, is whether to hammock or snorkel. Remembering the minibar at the last minute, we raided it for Fijian beer to enjoy on the loungers. Despite 'Fiji time', days seem to pass by far too quickly. Before we knew it, it was time for Lovo and Meke night. The resort staff puts together an intimate feast of Fijian fare including roast pork and whole black snapper, kokoda (ceviche in coconut cream), ota & chickpea salad, taro and more served buffet style. But first, a dance - Meke! In keeping with the intimate, cozy family-run vibe of the resort, the meke dance presentation was not elaborate either, it wasn't polished and professional, but that's what was endearing about it: it was the staff of the resort and their families from the local village, just giving us a glimpse of their culture and celebratory song and dance. And it was full audience participation too - they had everyone up on their feet and doing a sort of Conga line around the pool! With the communal tables, set dining hours and engaging activities, you get to meet a lot of fellow travelers from all around the world. We met some amazing people from Germany, Switzerland, Sweden, Australia - from their twenties on up. We closed out Day 2 with a fire dance, a bonfire on the beach, and that game where you stick a piece of paper to your forehead with a famous person written on it - and you can only use yes/no questions to try to glean from those around you, clues to figure out who you are. A fun game to play at the bar, on the beach, by the bonfire. All I could think was: please don't make me leave. Fiji is just a relatively short 10 hour flight from LA We were due to arrive at Nadi International at 6am, and from there had a tight schedule to get to Denarau Marina, on the northwest side of the main island, in order to catch *the only* boat that day headed for the Yasawa islands at 8:30am. Luckily, our flight arrived early, in time to catch a free shuttle supplied by the boat company. One hour later, just past 8am, we checked our bags and hopped onto the bright yellow Yasawa Flyer, which was to take us on a 4.5 hour trip around the Mamanuca and Yasawas islands. Our favorite from afar was Beachcomber island - a perfect, cozy disc of an island, rimmed by white sand, underneath the bluest sky, sun-kissed sea, white clouds, palm trees. But, Beachcomber's reputation is as a place for the hard partying crowd, so on we went towards the more remote and serene northern Yasawas. We passed Octopus Resort as well, said to be tied for the best resort in the Yasawas besides Blue Lagoon Beach Resort, where we were going to stay. But, we had to consider that Octopus was too far south to allow for a visit to the Sawa-i-Lau limestone cave, one of the key stops for our visit. Blue Lagoon (yep, where they filmed that Brooke Shields movie), at Nacula island, is one of the last stops. The main yellow boat has a very efficient drop-off/ pickup system: at every stop, instead of taking time to dock - they stay in open water, and resorts send smaller speedboats up, in order to collect incoming guests and their luggage on one side, while on the other outbound guests embark for their return trip. The Yasawa Flyer is apparently also the main source for supplies for resorts - along with our bags they also loaded produce and other items onto the speedboat. As our boat pulled up, resort staff were lined up and broke out in song to welcome us. A fresh tropical juice blend served as welcome 'bula' drinks. After a quick orientation, we were led to our beachfront bure (bungalow). We had found the best price on Agoda. Like most resorts in the Mamanucas and Yasawas, one resort offered multiple levels of accommodations: for backpackers and low budget travelers, there were shared dorms that sleep 4-8 with shared bathrooms (just $43 USDpp/night!). Lodge Rooms sleep two but also share bathrooms with the dorms ($80 USD /night) For a little bit more per night, you could get a garden view bungalow with private bathroom (~$200 USD/ night). Top of the line rooms were premium beach front bungalows, literally on the sand just steps away from the water - and we found a deal for $288.50 USD per night total including tax! Try to get that pricing in Hawaii for a room on the sand?! And it was worth the 'splurge': with these rooms you are not only so close to the water you can hear the waves through the windows, you also get a private hammock, and reserved lounge chairs under a cabana. The rooms are ceiling fan cooled, so it can get a bit hot, but we were excited to just be in the Yasawas (a Fijian word that literally translates to heaven). After some quick hammock time, it was time to speed walk to the resort's restaurant to catch lunch. In the Yasawas, resort restaurants have mandatory meal plans with set per person pricing that they charge to your room. Breakfast, lunch and dinner are served at set times - with snacks in between - and you can't just walk up and order whenever you want. This is the tradeoff for being remote - resorts have to be able to plan their supplies carefully, after all they only get one boat a day with supplies from the main island. But luckily Blue Lagoon Beach Resort is said to have some of the best food in the Yasawas, and it lived up to its reputation! For our first day lunch, there was a short menu of options including burgers to cater to picky eaters, and one dish that immediately jumped out to us foodies looking for local fare: Lolo (mahi mahi fish in coconut cream with cassava). I normally find mahi mahi too tough and dry, but this was perfectly cooked: tender and juicy, with a delicious coconut cream sauce that we wanted to lick off the plate. Another resort convenience is activities coordination: there's always options for each day, posted as blackboard specials - and you can choose to engage as much or as little as you wish. For the first day we took it easy - easy to do as the Blue Lagoon is known for its beautiful beach and soft coral diving accessible right from the resort! With our own snorkel gear ready to go - we dipped in for a quick look around, swimming with fish and great visibility (20 feet?) in clear waters before taking a much needed nap. After a long travel day, it was nice letting the sounds of the ocean lull you to sleep. Getting up for Happy Hour, we made our way to the bar for super touristy island drinks (what's a tropical vacation without them?). Alcoholic drinks are the only things not included in mandatory meal plans, but the drinks are very reasonably priced. The Pina Colada ($16 Fiji ~$8 USD) was on point. I did attempt to ask for something local - and our friendly server said he would make me something off menu. What came back was this lovely Bula (Fijian term used in the way Hawaiians use 'Aloha') drink - with ingredients that would go into a white Russian ($16 Fiji ~$8 USD). But everything tasted super fresh and perfect for a hot day on the beach. We did get a taste of the very distinctly Fijian drink just a little while later, when two staffers set up a mini kava ceremony for guests. Kava, made from the root of the yaqona plant found in the western pacific, is dried and pounded into a powder, then strained with water to create a drink that has sedative and anesthetic properties. Traditionally, it was used to welcome guests - bringing two groups of people together - and a requisite gift when paying villages a visit - but is also consumed at all times of day. Kava is served in a large freestanding wooden bowl, scooped out with a half coconut shell and passed around the circle of guests. You get to choose 'high tide' (full cup) or 'low tide' (half cup). As a first timer we went for low tide. You clap once with hollowed hands, yell 'bula! ', drink the entire shell's worth of liquid in one go, then clap three more times and say 'moce' (mo-they, which means goodbye). It looks like muddy water, and tastes like it, with a slight bitterness that gives way to a numbing of the tongue. I did feel a bit sleepy after. Definitely an acquired taste - but we could see why it would be so beloved for its natural ability to help people relax, and its unifying powers as a social 'ice breaker'. With the kava starting to take effect, we were in 'chill' mode for the gorgeous watercolored sunset over the beach. And before we knew it, it was time for dinner. This first night, it was a set meal - a platter of fried octopus, calamari, grilled shrimp on skewers, mussels in coconut milk, and various veggies with rice. With that wrapped a relaxing first day in Fiji! Stay tuned for a recap of Day 2. Fiji has been one of my bucketlist destinations for a long time, but I never really allowed myself to dig too deeply into it, lest I be crushed by the realities of budget and time constraints. Like most people, this particular four letter word evokes images of white sand, pristine beaches with dreamily clear turquoise to azure hues - a utopic place where it's hard to tell where the sea ends and the sky begins. Most people also immediately think of "honeymoon" and luxury resorts - neither of which were in my foreseeable future. But then my 'year of yes' happened: after more than a decade of toil, I was finally at the best place I've ever been in my career; frequent business travel had made me more comfortable in/proud of my independence; outside of work, some incredible people had become a part of my life, who share interests in food / travel...and then a flash sale came up with Fiji Airways, with flights from LAX to Nadi-Fiji for under $800 roundtrip. After getting re-certified as a PADI Open Water Diver in the (to us) frigid Paciifc Ocean last year, @gourmetpigs and I had been talking about going somewhere tropical for more enjoyable, wet-suit free dives - and Fiji would fit that bill perfectly PLUS offer land adventures via lush rainforests and cultural experiences from kava to village visits. It would be the best of nature + culture. After some quick research on accommodations, we were excited to find that it was totally affordable - there was a happy medium between the much publicized extremes of the 5-star resort with private butler, and roughing it backpacker style in bare bones dorms shared with strangers. We could go, "flashpacker" style. With 333 islands said to be in the Fiji network, and only five days in that #bucketlist paradise, it was difficult to choose which to visit. So, we started by identifying the main attractions in each island system, and figuring out which are our priorities AND feasible to do with our limited time. While the beaches look gorgeous, what distinguishes Fiji from other tropical destinations is underwater: its vast expanse of soft coral, and rich marine life including sharks that live in the area. Since our main reason to visit was to dive, that narrowed down to Taveuni (the Garden island), Vanau Levu (where the world famous Rainbow Reef is located) and Beqa Lagoon (off the main island of Viti Levu). After reading about the Mamanuca Group of islands as party central for twenty-something backpackers, we decided to avoid them. We did see that getting around the islands takes time, and meticulous planning (if you are not going with an all inclusive tour group / high end resort). There was only one boat per day leaving from the main island (where the airport is) - to the island groups west / northwest of it. If you miss that, you could either attempt a last minute seaplane booking at $375 Fiji (~$187 USD) per person flight, or you're stuck in a touristy part of the main island for one night. Luckily, my OCD self enjoys creating spreadsheets and planning - to ensure we can maximize our time and get where we need to go in order to make it happen. After looking at our options and what we can fit within 5 days, we decided on a combination of Yasawa Islands and Viti Levu (main island). Sometimes, you just want a quick, fantastic piece of cake. No meal, no fuss, just a fabulous dessert - and not necessarily for your birthday. Lady M doesn't always deliver on 'quick', but they definitely satisfy the need for 'fantastic' when it comes to their crepe cakes. Known for their 'Mille Crêpes' cakes: the wondrous creations with twenty or more crêpes, layered with the lightest pastry cream, the international dessert house has its LA outpost mid-City, on the same block as AOC. The storefront / pseudo-cafe is tiny, essentially a cake counter plus a handful of tables inside and out on the sidewalk. There is almost always two giant lines, one for to go / pick up orders and one to get seated - unless you manage to arrive early, right at opening. One look at the case of beautiful cakes / pastries, and any stress of the day or from the wait will melt away. Over several rare days when I was able to get up early to go, I was able to check out different flavors of their Mille Crêpes: signature, green tea and seasonal flavors like chocolate or chestnut (yes, unbelievably, chocolate is considered seasonal). The Signature Mille Crepes ($7.50) cakes are the best elements of crepes, creme brulee and cake all in one. The handmade crêpes are paper-thin, soft yet structured, and in between each of the 20+ layers are unbelievably delicate, light airy pastry cream. To take the whole thing to eyes-rolled-way-back, audible-moaning good, they caramelize the top of the cake ever so slightly so that it has that crisp, intensified sweetness with just a trace of smokiness that you get from a torched top of a creme brulee dessert. Of all the flavors though, Green Tea Mille Crepes ($8) stands out as my favorite - instead of caramelization, the top of this cake is adorned with a green tea powder. The distinctive taste of fresh green tea is pleasantly expressed throughout the piece, in perfect balance with the sweetness of the crepes and pastry cream. I've tried a few of their other cakes, like Strawberry Mille Feuilles ($8) and Banana Mille Feuilles ($8), but none are as mind-blowingly great as the Mille Crepes. If you dine-in at the cafe, don't miss the Lady M teas - my favorite is Royal Wedding ($6) - hate the name, love the fragrance and flavors: it's a white tea blended with almond, coconut, vanilla and pink rosebuds. Perfect paired with any of the Mille Crepes cakes. My only wish for Lady M is that they would build out a bigger, better space that can provide an experience to match the high quality of their desserts and tea - a place that allows for a more relaxed and refined environment to enjoy it all. The current space is cramped, noisy, and stressful as there's always other guests hovering just a few feet away, hangrily waiting for you to finish so that they can take your table. And with the current design, it looks like open seating, so newbies are always diving in to try to snag tables even before they had been cleared - and it's almost a groundhog day situation on fast forward, where every 10 minutes or so the poor servers have to bat people back to clear space and/or restore order / appease angry guests who had been waiting. If you want to avoid the chaos, get in the other line - for to go / pickup. Mille crêpes are available single slice, as well as full sized cakes - and has become my new go-to for VIP birthdays. Prices range from $40 for a 6-incher, to $75-$80 for a 9-inch. It's been more than 10 years since I'd visited the restaurant (formerly Barney Greengrass) inside Barneys New York in Beverly Hills. The place has been completely replaced by Freds last October, a modern, sleek, open space with outdoor balcony seating, overlooking some of the most expensive real estate in the city, yet with an unexpectedly laid back vibe. I love that as a part of this menu they also offer fresh, house made juices including the Orange is the New Black (orange, carrot, ginger, turmeric) ($9) or Green Jeans (apple, spinach, kale, cucumber, celery, romaine, ginger), and some can even be spiked with your choice of spirit, the better to enable you to justify your liquor intake as being 'better for you' (could this become our new favorite way to 'juice')? We were able to also sample some of their food offerings at a preview, including classic staples like tuna tartare, and dishes inspired by LA's fantastic farmers markets (one of their many flatbread options will be a special based on finds from Santa Monica Farmers Market). But the unanimous favorite at our table was the steaming Robiola with Truffle Oil Pizza. I'm not normally a fan of truffle oil, but it works with this delicious cheese bread 'pizza' that's fresh from the oven - it will take willpower stronger than mine to resist snacking on basket after basket of these (yes, we did shamelessly ask for second rounds, actually). Another standout was one of the three dipping sauces that accompany the Pommes Frites: Calypso sauce made with cognac and orange juice. Prices are also pretty reasonable considering the location on the 5th floor of a luxury goods store in the middle of Beverly Hills: flatbreads are $16-$21, and the fairly generously portioned tuna tartare is $19. At the fairly affordable prices (for Beverly Hills), and lesser known (for now) location - this could be a great option for a late afternoon / early evening escape from LA rush hour - a place to unwind with coworkers, retreat to a quiet corner to discuss that all-important deal, or micro-analyze the latest episode of the Real Housewives over some sips, bites above the fray of Wilshire / Santa Monica / Beverly. Regular menu also served lunch daily and brunch on weekends.